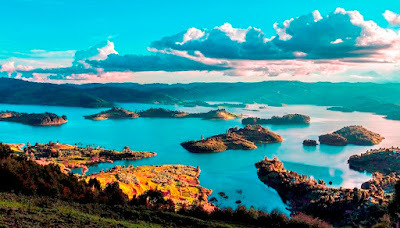 Lake Bunyonyi is located in a flooded valley system, which extends northwards direction from Rwanda extreme border over an estimated distance of like 25 kms and passes through the lines of the steep hills that divide the two districts of Kabale and Kisoro in south western part of Uganda. The loviest lake is one of the interesting destinations which are attracting different travelers to Uganda. Lake Bunyonyi is said to have been formed late back approximately 8000 million years ago, and the process of its formation was described as a result of lava flow that emerged from one of the well-known Virunga Mountains and managed to occupy Ndego River and when it continued ,it blocked the river which is current identified as River Muko and as a result it created a dam. Activities include swimming, walking, and bird watching as well as canoe and motorboat rides. Cultural and historical tours of nearby villages can also be arranged. The lake stretches out for you and is navigable by canoe skippers per canoe, shuttling back and forth between the 39 islands in this lake. 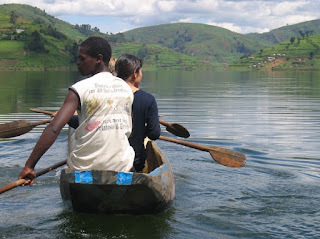 Children go to school by canoe, and market products are transported in this way. Lake Bunyonyi is the perfect place for relaxation! Only the countless birds provide still warm melodic sounds on this island. We shall start from Rutindo trading centre at 9am and canoe across to the lush terraced hillsides of the Kyabahinga peninsula. There, when school is in session, we will be able to meet the children at school and singing and dancing by the children will be presented and you are allowed to join them (dance). We will hike at Kyabahinga above the school where you will be able to meet the locals at trading centre. You are most welcome to have a taste of the local beer. You won’t forget this experience. Later, you will meet a traditional healer at the top of the hill at Kyabahinga. He will be able to tell you all the plants he uses to cure diseases. Then we will pay a visit to cultural village campsite on top of the hill for a juice and stories of Lake Bunyonyi and the Bakiga tribe. While at this campsite, you will be able to view Lake Bunyonyi and it’s 29 islands. The stories of Lake Bunyonyi and its unique islands will be told. Later, we will join a local family for lunch. After lunch, you will help with washing of the plates and experience how African women do the washing. After lunch, you will bond with local crafts ladies for another beautiful experience of making crafts. You will be able to learn how to make simple crafts and once you done one or two… you can take it. Already, you will have had the chance to meet the local people and after we will go into our canoes and head to Bushara Island. You will do a nature walk around the Island. Stories and tales about Bunyonyi will be told as you walk through around the Island. You will then head to the punishment island, the island destination to dump pregnant yet unmarried girls. During the walk at Bushara, you be able to learn more about the vegetation and its use to the local people ranging from herbs to personal hygiene. After Punishment Island another bit of Lake Bunyonyi's history will be revealed to us: Bwama Island, a former leper colony. It is nowadays an impoverished boarding secondary school. Then after a tremendous trip, we will stop at Nature’s Prime Island for dinner. After dinner we will go back to the mainland or you might want to stay at Nature’s or with a local family around. The price includes everything during the day (transport to and from the lake, guiding, meals, water, juice and all activities. Amatsiko means Hope in Rukiga, the language of the Bakiga, the local tribe in Kabale district, south west Uganda. Amatsiko Organization is a community based organization (CBO) operating in South- Western Uganda, Kabale District, Kigezi Region. Our mission is to transform the lives of children and their communities by providing them quality education, clean water, affordable health care and empowerment through sustainable projects. The project is currently running a nursery and primary school supporting 173 needy children and their communities in need by providing free education, 3 meals a day, as well as board 36 children at the project rented premises. In the next 3 years, the project wishes to help more children, gain more sponsors and to develop its programme to include the construction of an education resource hub and income generating projects such as beekeeping, rabbit farming, water filters, Amatsiko Cinema and crafts making. We are hugely grateful to all of those who have shown generosity and kindness by supporting our organisation.